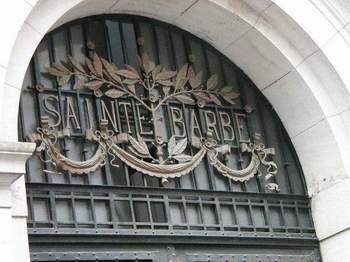 We started our walk yesterday at the base of the lively rue Mouffetard in the 5th arrondissement. This ancient market street is always teaming with activity, any day of the week. At the base of the street is a pretty old church, St. Médard (15th-16th century), and a fountain that uses excess water from the Arcueil Aqueduct that Marie de Medici had constructed to supply water to the Luxembourg Palace. The church was built with a gift from Anne of Austria, who was still childless at age 37 after 23 years of marriage. 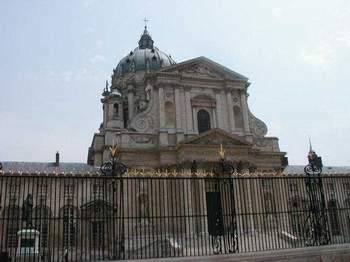 She promised God a magnificent church if he'd answer her prayers, and when Louis XIV was born in 1638, she made good on her promise. We almost saw another church, up the street on the rue St. Jacques, but a funeral was about to start so we quietly slipped away and stood under an awning across the street, waiting for a thundershower to stop. Then we meandered through charming streets of the 5th, past the Curie Institute, and up to the Pantheon, where we waited out another shower. 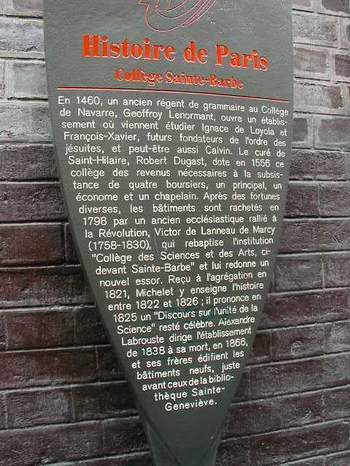 Then we decided to walk up to the Seine to the Shakespeare and Co. bookstore, and we sat in Square René Viviana, not far from the oldest tree in Paris, across from Notre Dame, and read FUSAC ads for real estate sales & rentals. 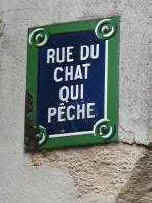 Then we wandered aimlessly through the ancient, narrow streets of the Latin Quarter, finding the tiny alley called Chat qui Pêche (cat who fishes), and finding some friendly, playful cats there. Continuing our lazy, worthless behavior, we settled into the leafy, pretty terrace in front of the Hotel Dégres Notre Dame for refreshments. And after a while we wandered home, read for a while, and went out to eat at 8:30 at another one of the exceptionally good, exceptionally reasonable French restaurants in our neighborhood. 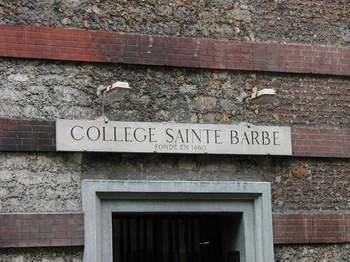 Just for the fun of it, I took a couple pics of the signs for a arts & sciences college located just north of the Pantheon -- College Sainte Barbe, established in 1460. Some tourist left a suitcase with her dirty laundry in the area under the glass Pyramid at the Louvre. Seeing the abandoned suitcase as a possible security problem, the authorities evacuated the Louvre. Crime is up in France because in recent years they adopted the law that one is innocent until proven guilty. Juvenile delinquency, in particular, is up. People robbed the drivers of an armored car in Lyon yesterday. One of the culprits had a submachine gun. One of the drivers is in serious condition, and the other one managed to shoot back at the robbers, hitting one of them & killing him in the street. The others got away. Lionel Jospin and his wife, Sylviane, are vacationing on the Île de Ré, where they own a house. They were pictured sailing a small boat. Air pollution is up all over France. The French are supposed to drive more slowly in order to help lower the levels of particulate matter in the air. But they aren't slowing down, and police are busing giving them tickets & fines of about $70 to $140. The residents of the neighborhood around the canal St. Martin are fed up with the street musicians and revelers who keep making music & noise until 3AM or so every night. They're passing around petitions to "reclaim the calm." 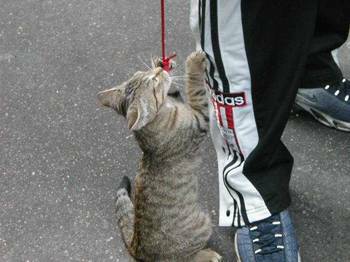 This kitten who lives in the Greek resto next to the passage called Chat qui Pêche was willing to play with the loose strings on any tourist who passed by. 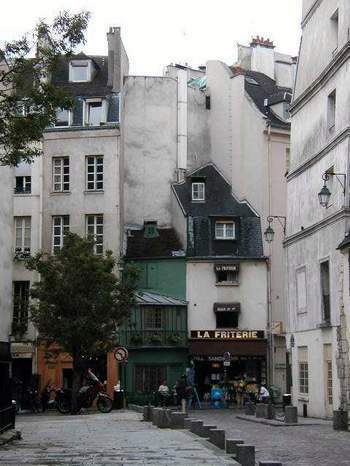 In the Latin Quarter, medieval houses remain. The green one is especially old -- it is built of wood, not stone -- one indicator of its age.